Seven masked bandits, whose chief calls himself "Mormon", kidnap young Susy, cousin of the mayor of Clayton City, Frank Clonny. Frank accepts the $ 15,000 ransom requested by the bandits and thinks of a plan which will permit him, with the help of Benson, the sheriff, to free his cousin, recover the money and capture the outlaws. The plan, though, is destined to fail, because one of the mayor's men, Donovan, allows the bandits to escape the trap. 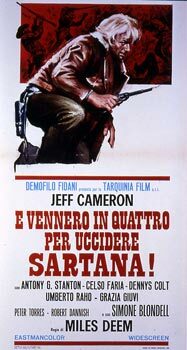 Benson then decides to call in Sartana, who the Mormon immediately tries to eliminate with the help of four killers: Buffalo, who kills with the ball-whip; Martines, an expert knife thrower; Sullivan, a giant of incredible strength and Silk, a sly and fast gun-slinger. The first three are readily eliminated by Sartana, who also disvovers the true identity of the "Mormon", who proves to be no other than... The story ends in a duel between Sartana and Silky.